At Blue Water Spa, all treatments are designed to deliver both unparalleled pampering and immediate visible results. Only the finest products are used in skin and body care treatments. A treatment can only be as good as the individual performing the service, and our aesthetic professionals are the best anywhere. They receive ongoing advanced training to ensure they have the most up to date information about skin and body care. Our therapists never leave the room during a treatment. They provide consistent pampering and results from start to finish. When visiting a spa we all want the most relaxing, pampering and luxurious experience in addition to lasting results and glowing skin. At Blue Water Spa, our commitment is to provide relaxation, results, and stress relief in a beautiful relaxing environment where all guests will be pampered and made to feel very special. Spa gift certificates are becoming more and more popular and are right at the top of everyone’s holiday wish list. Spas offer stress-relief, pampering, and results. Spa gift certificates are a wonderful way to show someone special how much you care. Visiting a day spa’s web site can give you an idea of the spa’s environment, their experience and philosophy. The spa experience begins when a guest enters the door. By taking a virtual tour, you can get an idea. -Can Gift Certificates be sent immediately via email? For those of us who wait until the last minute, gift certificates that can be purchased over the phone can be a big help. In most cases, gift certificates can even be emailed to ensure “on-time” delivery. Blue Water Spa in Raleigh, NC, offers instant printable gift certificates. -Do Therapists (facialists, massage therapists, etc.) have sales quotas? I know it’s crazy, but it’s true. Some spas actually have service providers on quotas. A relaxing experience can quickly turn tense if a therapist on sales quotas begins to suggest additional treatments and products that won’t benefit the client. Add-on treatments should be suggested only if they will truly benefit a client. Likewise, home care products can enhance the result of a treatment, but if the conclusion of a treatment includes stress to purchase products, much of the relaxation benefits are eliminated. -Do the aestheticians (facialists) ever leave the room during a treatment? The therapist should be in the room at all times delivering pampering, relaxation and results. A client who is left alone can feel forgotten and uneasy, and that they are not getting the best treatment possible. One of the most disturbing practices happening in spas today is leaving clients unattended in treatment rooms,” says Kile Law, owner of Blue Water Spa in Raleigh, NC. Rather than giving clients 100% of their attention, many spas actually have therapists working on two clients in different rooms at the same time. It is not unusual in some spas for a client to be left alone under a facial steamer or with a treatment masque on their face while a therapist starts a facial on another client in a different room. In some spas, facialists are performing waxing treatments on one client while another client is left alone waiting for the therapist to return, often for extended periods of time. Being left alone in a treatment room is not only uncomfortable and stressful for a client, but it can be dangerous. Clients could fall off a facial table, be burned by a steamer or end up with a reaction from a product left on their skin too long. 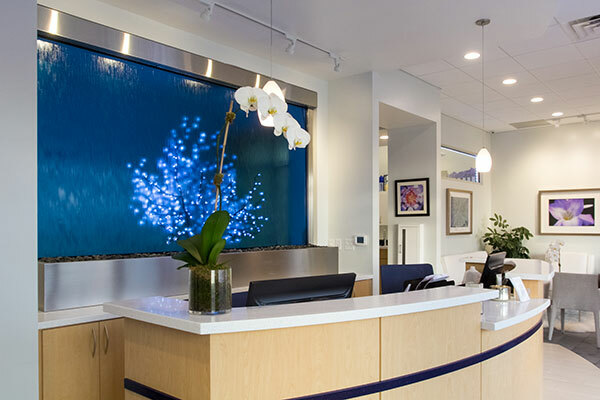 Many people going to spas are looking for stress relief, relaxation and a little “alone time.” At Blue Water Spa in Raleigh, NC, the policy allows for quiet time when clients will sometimes drift off to sleep. Giving a person peace, stress relief and relaxation in a quiet, dimly lit room can be extremely relaxing. But a better, safer alternative to having a therapist leave the room during a treatment is to have a therapist quietly and expertly massage the upper body, hands, arms, feet or scalp of a client receiving a spa treatment.